I have a Bianchi Denali as described that is in great shape, mostly XT, all original with lugged frame and a super awesome paint job - kind of a gold and black. I am interested in value not necessarily for resale but just to know. It is also made in Italy. My guess is it's a mid-90s bike. I was thinking about giving it to my kid for commuting but it's seems like a very nice bike. I am interested in information, significance of the lugged frame, possibly production numbers and popularity. never one to wait for sound advice I snapped it up it's got a light on the front fender! just scored a Klunker 5 for cheapsies. sweet all original. am gonna put an engine on it after i get the sprocket machined to clear the drum brake assy. Also i am customizing a disk brake hub from a 72 road bike to fit the front, so i will have excellent brakes front and back. It doesn't show up in the pictures, but there is one small dent in the top tube right side, at the top left of the "800 Series" decal. It's small and round, not sharp, and did not appear to be any kind of an issue. The wheels are strong enough for expedition type touring. Wide polished rims, 36 spokes, sealed industrial cartridge hub bearings, and oversize solid axles. The zinc spokes were really ugly so I relaced the wheels with brand new Wheelsmith stainless steel spokes. The bike has all original components except for: Grips (Velo-Orange Cork/synthetic),Velo-Orange front brake cable stop, all new cables and housings, and new tires and tubes. I have street tires on it right now, but I still have the original mountain bike tires, and they actually still appear to be serviceable. I’m trying to determine if my ’84 Trek 830 has any real collector value, or if it is really “just another bike”. Any help would be appreciated. Here is what I know about the bike, what I’ve done, and a link to pictures. The serial number chart at http://www.vintage-trek.com/SerialNumbers.htm shows that less than 800 830s in the 18" frame size (the frame size of this bike) were produced in the whole production year! The 830 is a lugged steel Reynolds 501 frame. I have a 1989 Schwinn High Sierra. The original Kenda 26X 1.62 knobby tires are shot, and replacements are no longer made. These tires had a gum sidewall that has disintegrated, so if there was an ISO number, it is no longer visible. I called a national on-line retailer for help finding something that would fit the Weismann 522 X 26 X 1.50 rims. They were cautious to suggest anything w/o an ISO number from the tires. Does anyone have a suggestion for a good tire for this bike used mainly on county hard surface roads and forest service (hard packed dirt) trails that would fit this bike and rims? My nearest bike shop is 65 miles away, so I would like to be able to order on-line and replace them myself. I want something durable that is not too wide so there will not be issues with the brake or fork. Go to First Flight Bike, check out the Timbuk 2, 26 x 2.0 it will fit the 1.5 rim. great gum wall new production tire. I am usually on the lightweight discussion group....but I just picked up an old mountain bike - and I can't find any information on it. It says "Oneill" down the seat tube and and "Instinct" on other locations. The frame material is triple butted ChroMo, it has Shimano Deore components. It has the paint scheme of the colorful squiggles....like late '80's or very early 90's, Araya alloy rims, It has 2 bottle cages going down the down tube (I've never seen this before), It has an "R" on the stem...which is the same paint scheme - so it would have come originally on the bike....I don't know if the "R" is for Raleigh or for Ross....or anything else? No other name or brand on the bike. Oh, 6-speed.....and thumb friction or indent shifters.....which makes me think closer to mid '80s. Anyone have any idea what this bike is? I have never heard of it before. My husband picked up this bike for me at an older gentlemans house and it is in really good condition! I was just trying to figure out how old it is. It is a Raleigh Elkhorn Mountain Bike with Serial Number 7AU048 & it is like a turqoise color. Any info would be great! Thanks. Yesterday I got a 1988 or 89 Tom Ritchey Ultra, it was missing the wheels seatpost, saddle and rear derailer. Most of the decal are missing and there is just a fain impression of the TR sticker. It has mostly Shimano XT and Ritchey parts. Ther serial # is 176?, I'm looking forward to fixing it and riding it. I'm trying to find out the Year of Mfg. of a very odd older, ridged MTB? It's called a "Trail Ridge" on the front plate and it's got the name: Trail Head in decal on the top tube. Orginally I picked this up for cheap for a back up bike for ME but my Son needed a bike so I gave it to him. Now just trying to find out what year it was and where it came from, thanks! We have a Vintage Kuwahara Mtn bike from 1985. All original except for seat. Red with yellow lettering. What all info do I need to value it? I haven't seen anything like it for sale. It took me all of 5 minutes to find 2 rideable complete SE1000 bikes for $200. entry level bike. cheapest model made. under 200 new. 50-75 tops with nice original paint and good rubber. 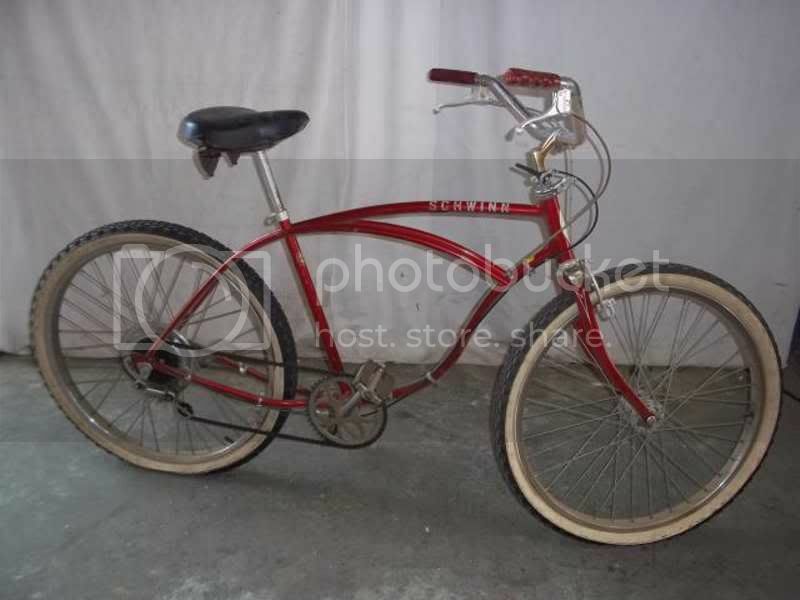 I'm interested what is the name of this Hercules bicycle and it's production year or period of manufacturing. Also origin - German, British or Indian. Thanks. Try posting that photo under the English Roadster topic. Got here by accident, this Hercules is not British. Also the handlebars are far too high.